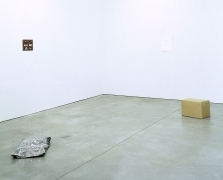 Sean Kelly is delighted to announce the first major New York exhibition by British artist Gavin Turk. Gavin Turk's artistic career began in 1991 when he was denied his MA certificate from the Royal College of Art for his degree show presentation, which consisted of an empty white studio with an English Heritage plaque installed, which simply bore the inscription "Borough of Kensington Gavin Turk Sculptor Worked Here 1989-1991". 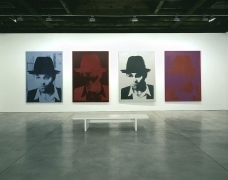 In the 1990s, Turk came to prominence as one of Britain's infamous "Young British Artists" and was included in the influential Sensation exhibition in 1997. The exhibition is comprised of new paintings and sculptures. In the Main Gallery a group of works from the White Elephant series, extends Turk's investigation into ideas of authorship, authenticity and identity. 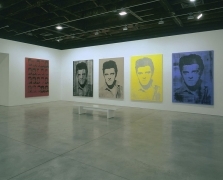 These museum scale canvases depict the artist, in the personae of Che Guevara, Elvis Presley and Joseph Beuys, all in the style of Andy Warhol. This subtle and characteristic appropriation of identity, if not immediately apparent to the viewer, is alluded to in Turk's purposely-misspelled title "Che Gavara" utilized for one of the works. Installed in Gallery 1 is Pile, a painted bronze sculpture of a pile of garbage bags, which seems implicitly to give value, historical importance and permanence to superfluous refuse. In this work and others, Turk explores the way in which a work of art is conferred with iconic status and value. 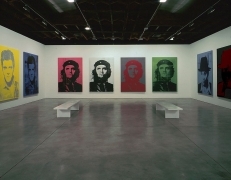 Two pieces in Gallery 2, Self portrait with hands around neck, a frame previously used for a Warhol painting with a blank canvas, signed by the artist, and Metaphysical Nail, a sheet of white paper nailed to the wall and signed by the artist, specifically comment on and question the artist's signature as sign of identity and value. These works take a rigorous, yet playful, amble through the crisis of originality and value in contemporary art, with wry humor, informed elegance and a nod to the work of Rene Magritte and Marcel Duchamp amongst others. Gavin Turk's work has been included in several seminal exhibitions including: 6th International Istanbul Biennial, Istanbul in 1999; Material Culture, Hayward Gallery, London in 1998; Sensation: Young British Artists from the Saatchi Collection, Royal Academy of Arts, London which traveled to Hamburger Bahnhof, Berlin, Germany and the Brooklyn Museum of Art, New York in 1997 and Young British Arts III, Saatchi Collection, London in 1995. Recent exhibitions have included: The Golden Thread, Sculpture at Goodwood, West Sussex; Gavin Turk: et in arcadia eggo, New Art Centre Sculpture Park & Gallery, Salisbury; Gavin Turk Oeuvre, Tate Britain Sculpture Court Display, London and More Stuff, Centre d'Art Contemporain, Geneva.